Sanur takes you to a relaxed stretch of golden sands on Bali’s south east coast. It’s known to be one of the most tranquil resorts in Indonesia, making it ideal for couples who simply want to relax. Spend your days stretched out on the sands, soaking up the sun before taking a cooling dip in the crystal clear sea or trying some of the water sports on offer here. There’s a large coral reef located just off the coast, which protects the beach from currents, making it perfect for both little paddlers and those who want to explore underwater. When it comes to dining you’ll find some fantastic seafood restaurants, as well as bars where you can watch live music as you relax with a drink after dinner. If you want to explore further, Ubud is within easy reach and offers temples, art galleries and beautiful natural rainforests. Or you could head to Seminyak, which has a livelier beach backed by bars and restaurants. Holidays in Sanur centre around its pristine sandy beach. This large stretch is home to crystal clear waters which are ideal for families, as well as quiet areas where couples can spend their days relaxing in the sun. Spend your day exploring the little boutiques and designer shops where you can pick up souvenirs and gifts, or make the most of your luxury hotel. Book with Sovereign and we’ll help you find the ideal hotel for your luxury holiday in Sanur. We’ve put together our selection of the best properties to help you find the perfect setting for a relaxing break. Stay at the Fairmont Sanur Beach and take in spectacular views of the sea from the spectacular infinity pool. 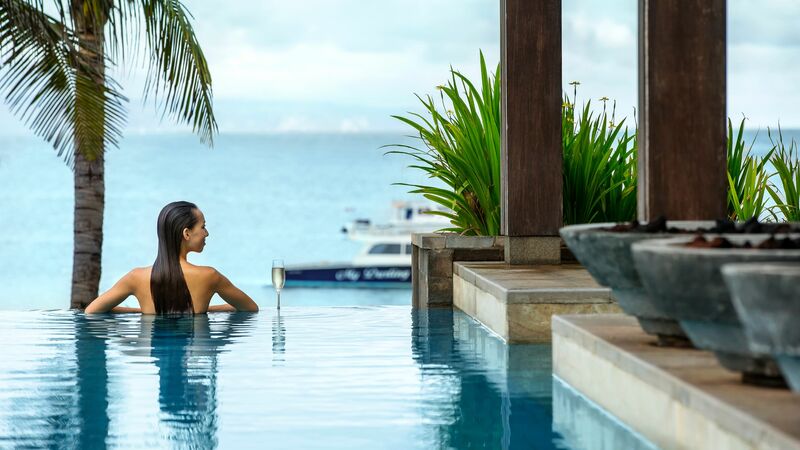 The spa is the perfect place to relax as you immerse yourself in the serenity of the luscious surroundings, while there are some fantastic dining options as well. Flight time from the UK to Bali is around 16 hours. Transfer time from Bali airport to Sanur is approximately 30 minutes. Situated close to the equator, Bali has a tropical climate with two distinctive dry and rainy seasons. The rainy seasons last from around November to February. April to June is a lovely time to visit Bali; it’s dry, temperatures hover around 27°C and there’s less humidity than in July and August. Currently visas are not required for UK citizens travelling to Indonesia for 30 days or less. Tipping isn’t required in Bali as a service charge will generally be added to your bill at restaurants and hotels, so there is no need to leave a tip as well. However, if you wanted to leave a tip for excellent service, aim for 10,000 to 20,000 rupiah for drivers, porters and wait staff (although try to hand it to them directly rather than leaving it on the table). The official language of Bali is Indonesian. English is widely spoken too.